^ a b Goldstein, Richard (20 January 2013). "Stan Musial, Gentlemanly Slugger and Cardinals' Stan the Man, Dies at 92". The New York Times. Retrieved 23 January 2013. ^ Goldstein, Richard (2013-01-19). "Stan Musial, One of the Game's Greatest Hitters, Dies at 92". The New York Times. Retrieved 2013-01-20. ^ "MayorSlay.com (@MayorSlay) on Twitter". Twitter.com. 2013-01-20. Retrieved 2013-01-22. ^ "Tributes pour out for 'Stan The Man'". MLB Advanced Media. 2012-06-19. Retrieved 2013-01-22. 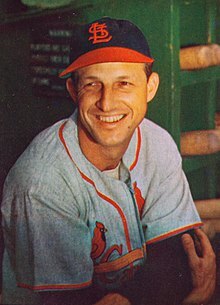 ^ "Senate Passes Bill Naming Local Bridge for 'Stan the Man' Musial". Office of Tim Solobay. 2011-05-24. Archived from the original on November 3, 2013. ^ Brett Blume (2012-05-24). "New Rescue Boats To Patrol St. Louis Riverfront". CBS News. Archived from the original on 2012-06-03. Retrieved 2013-09-30. St. Louis fire officials say they'll be more prepared than ever to make timely rescues on the Mississippi River once two new boats arrive.